What is eczema? Eczema is a medical condition that usually affects people with dry skin. Known also as dermatitis, eczema does not spread by touching or through the air and thus cannot be contracted from other patients. There are many different types of this skin condition and its symptoms vary from patient to patient. Children are among the most affected by eczema but it can happen to anyone. People who have had a past history of eczema when they were young may get eczema later on in their lives as well. “Atopic” is the name given to those conditions which happen when a person becomes susceptible to the common allergy causing substances found in air such as pet dander, pollens, molds and dust. 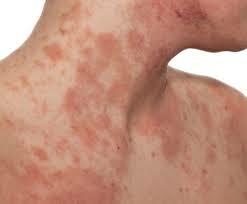 “Dermatitis” on the other hand is used to describe inflamed, sore and red skin. It is caused when you come in direct contact with the allergens. Its symptoms include redness of skin, burning and itching which go away when the contact with the irritant is broken. It occurs in winters and is likely to cause dry patches of skin on the legs which are round in shape. Men are at more at risk of developing nummular dermatitis. It mostly affects women and is characterized by itchy patches of skin on the soles of the feet, palms and fingers. These dry patches peel off regularly or can crack and become very painful. It is likely to make your scalp dry and produce itchy rashes on your nose, ears, eyelids and eyebrows. Eczema cause reveals the nature of "what is eczema". Although the exact cause of eczema is not yet known, however, doctors believe that eczema results from a hyperactive immune system’s belligerent response to exposure to allergens. Eczema is also caused due to an atypical response of the body’s immune system to its proteins. The immune system starts attacking the proteins of the body instead of the proteins of viruses and bacteria, resulting in inflammation. The appearance of multiple symptoms of eczema on the skin is referred to as an eczema flare-up. The common irritants that can cause an eczema flare-up are temperature and humidity changes, excessive perspiration, elevated body temperature, chemicals present in detergents, woolen clothes and synthetic fabrics, stress, infections of the upper respiratory system, animal dander and food allergies. The common indications of eczema are formation of dry patches on the skin that are either red or brow in color, excessive itching which increases at night, raw skin resulting from the constant scratching, scaly skin, cracked and thickened skin and small blisters, which when scratched start exuding fluid. Eczema in kids is referred to as infantile eczema and it can affect them in their childhood as well as in their adolescent years. Infantile eczema usually targets the scalp of the face and is characterized by formation of a rash that oozes and crusts accompanied with intense itching. As the baby grows older, the rashes dry out and turn brown while in adolescence they become thick and scaly. Atopic eczema is often accompanied with a bacterium known as staphylococcus aureus. It lives on the skin and attacks when the skin develops cuts due to excessive scratching by an eczema patient. This can greatly enhance the symptoms of eczema especially in kids. Besides the staph bacteria there are other factors which can aggravate the symptoms of this skin condition. These include stress, sweating, dust, cigarette smoke, having dry skin, pollution, foods like eggs, milk and wheat, soaps, solvents, detergents, sudden temperature changes, wearing woolen or synthetic fabrics, low humidity and taking hot baths. Eczema can be treated more effectively if treatment is started at an early stage. The more advanced its symptoms become the harder it is to control them. Therefore, contact your doctor immediately if the itching in your rashes becomes too much for you to handle and starts affecting your daily routine and your sleep. Consider seeking medical care if the remedies you use for relieving the symptoms don’t work, you are afraid that an infection has occurred or your skin starts paining. "What is eczema", "what causes eczema" and symptoms of eczema just let you know this condition better. How to treat eczema is the most important and practical thing. The medications or drugs that are used for treating eczema include antihistamines like cetirizine, diphenhydramine, fexofendaine and loratadine. Cortisone, hydrocortisone, oral corticosteroids, topical antibiotics and immunosuppressant drugs are other medications used to treat advanced symptoms of eczema. However, all of these have side effects and must not be used for long periods. Phototherapy and light therapy can be used to treat eczema too. These therapies involve the use of sunlamps which can help in stopping the immune system’s response causing the eczema and can also thwart the danger of infections caused by bacteria. Taking a good night’s sleep and practicing techniques for relieving stress like yoga, deep breathing and meditation can help in reducing the severity of eczema symptoms. Try to find out the irritants that trigger your eczema flare-ups and refrain from coming in direct contact with them. Add baking soda and uncooked oatmeal in your bathtub and take a warm shower. It will soothe your skin and reduce the itching. Make use of a humidifier to avoid sudden changes in humidity. Portable humidifiers can help in soothing the sensitive skin by moisturizing the air. Make use of mild soaps that do not contain any type of perfume or dyes in them. Make use of cream or oil to keep your skin moisturized especially after taking a bath. A lubricating cream can also be used if you have dry skin. Refrain from scratching the rashes as much as possible. Wearing gloves at night while sleeping and keeping the nails trimmed can also help in this regard. A few of the therapies and drugs used for treating eczema in adults are recommended for use in infantile eczema too. However, it is imperative that you consult your doctor’s opinion when using any sort of treatment for infantile eczema. Children who develop skin infections as a result of infantile eczema have to be admitted into a skin clinic to get the proper treatment. Does Athletes Foot Ever Go Away?